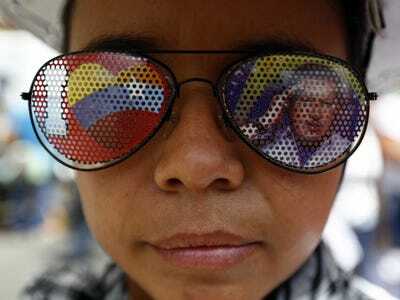 ReutersA supporter of Venezuela’s President Nicolas Maduro wears a pair of sunglasses with a picture of late Venezuelan president Hugo Chavez, during a rally in support of Maduro in Caracas October 18, 2014. Venezuelan investors are abandoning ship en masse after the government indicated that it will not take immediate measures to stop the country from sinking deeper into chaos. The signal to head for the exits was so subtle that you’ll have missed it if you weren’t paying close attention. This week the Venezuelan government reiterated that it would not devalue its currency, giving it more bolivars for every dollar. It does not want to do that because the country already has the highest inflation rate in the world at 64%. The official exchange rate is 6.3 bolivars per dollar, but the black-market rate sits at 113.62 bolivars to the dollar. “We’ve told investors to count on Venezuela, to trust us,” Finance Minister Rodolfo Marco Torres said in an interview this week. Investors did exactly the opposite. 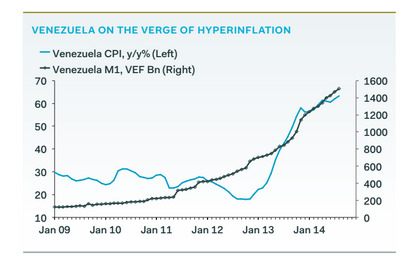 They’re abandoning Venezuela at a stunning rate. The country’s debt maturing in 2027 has fallen to a 6 year low of 55.1 cents, according to Bloomberg, down 14% in a month. This is, in part, due to a global economic shift. Oil makes up 95% of Venezuela’s exports, and the commodity has gotten absolutely crushed in the last month — down 28%. Some accuse Saudi Arabia of keeping the price low to compete with the world’s burgeoning natural gas industry — an allegation the Kingdom and OPEC have categorically denied. 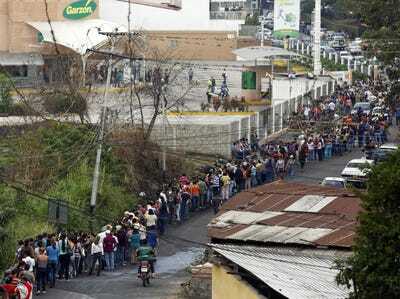 In the meantime, Venezuela is already suffering from “dire food shortages.” A lot of that food — along with other household goods — is imported, and the without cash from oil, the government will not be able to subsidise those imports, according to a report by research firm Stratfor. REUTERS/Carlos Garcia RawlinsPeople line up to buy food at a supermarket in San Cristobal, about 410 miles (660 km) southwest of Caracas, February 27, 2014. U.N. Secretary-General Ban Ki-moon and Pope Francis called on Wednesday for an end to violence in Venezuela that has killed at least 13 people and urged politicians to take the lead in calming the nation’s worst unrest in a decade. President Nicolas Maduro lacks the charisma of his predecessor, the late Hugo Chavez. His approval rating hovers around 30%, though the country remains more evenly divided about his socialist party. What this economic strain could do is take us back to last February, when hundreds of thousands marched through the streets of Caracas and other cities all over Venezuela. 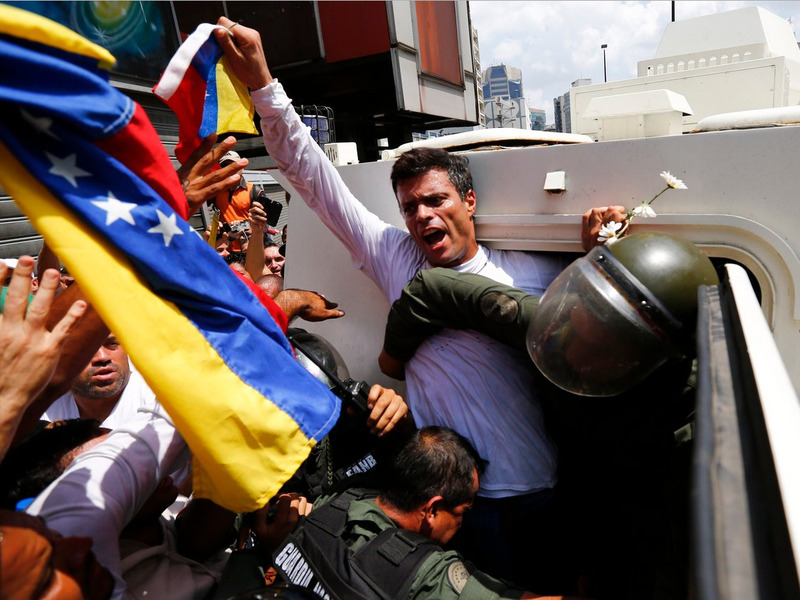 When the government had to engage in a campaign isolating or imprisoning opposition leaders like Harvard-educated politician Leopoldo Lopez (who still sits in jail awaiting his day in court). Back then the lines to get into government supermarkets were long. They will only get longer. The people will get angrier. Maduro will run out of time. But that does not mean he will let go of power. At least, not without a fight. ReutersLeopoldo Lopez turns himself in to Venezuelan authorities in February of 2014.